We’d love your help. Let us know what’s wrong with this preview of War Bonds by Cindy Hval. To ask other readers questions about War Bonds, please sign up. A solid 4.5 stars. Half a star off due to the "bitter" in the bittersweetness of the stories. It should come as no surprise, so I'm not going to call it a "spoiler", but not everyone from the 36 couples discussed are still alive today. That fact added a bit of poignancy to the love stories told, but it made me sad, so not a full 5 stars. I just want to say, to the couples and to all those who have served in the armed forces and at home, thank you. Thank you for your sacrifices so I and all who ca A solid 4.5 stars. Half a star off due to the "bitter" in the bittersweetness of the stories. It should come as no surprise, so I'm not going to call it a "spoiler", but not everyone from the 36 couples discussed are still alive today. That fact added a bit of poignancy to the love stories told, but it made me sad, so not a full 5 stars. I just want to say, to the couples and to all those who have served in the armed forces and at home, thank you. Thank you for your sacrifices so I and all who came after you could be safe and secure in their own home country. God bless you all for your service. I admit, as I type this, I am tearing up, This book was so sweet and heart-warming. It was full of hope and love and sadness. Some of the stories include what the men went through while fighting, the experiences they had and it wasn't glorious at all. Some of the stories were funny, but some were more tragic. This book is also sad, because the Greatest Generation is slowly going away and we will never see another generation that was so self-less,, so brave and honest and true again. Even the teenaged boys were men and the teenaged girls were women. They knew with startling clarity who they were, what they wanted and what was needed from them and they answered that call. It is so important that their stories are passed on to all the generations that follow. Hopefully, some of their courage, wisdom and common sense will penetrate into the minds and hearts of those who have come after, so we can learn and teach those who come after us. This book is incredibly important in keeping the Greatest Generation alive in our collective consciousness. I recommend it to everyone. Those who don't learn from the past are doomed to repeat it, however in this instance, I think it is more apt to say that if we don't learn from their past, we have no hope of repeating it. Universal truths, unique challenges, and uplifting tales. What a joy to read...and one you'll feel compelled to share with others. Equal parts heart-warming and life- affirming, War Bonds has it all. I love the storytelling and the details shared about each couple's experience. These were not easy times, nor easy situations. Each couple had their own personal journey to share, and I loved the opportunity to be an insider to that journey. Hval has a great knack for sharing "the real" in the story. Universal truths, unique challenges, and uplifting tales. What a joy to read...and one you'll feel compelled to share with others. Equal parts heart-warming and life- affirming, War Bonds has it all. Hval has a great knack for sharing "the real" in the story. The real journey, the real experience, the real emotions, the real people behind each tale. A relaxed writing style and a clear heart for sharing the truth makes Hval's writing a pleasure to read and her stories both heart-warming and thought-provoking. First sentence: Boy Scouts stood at solemn attention. Favorite quote/Love Lesson: The best thing we ever did was move away from our parents. Each chapter in this book tells the story of a couple who met and married in the 1940s and the husbands who went off to war. From blind dates to whirlwind romances to long separations this book has it all. I loved the pictures of when the couples were young and at the end of each chapter was a picture of how they look now. The author is coming to my library l First sentence: Boy Scouts stood at solemn attention. A solid 4-4.5 star rating for a collection of true historical romances (around WWII). There's plenty of pictures (then and more recent) and a piece of marital advice from each couple. I would have liked to see more diverse couples, but, overall a feel-good read that is well-organized. Some very interesting historical tidbits too. I think the author's next work should be about what happened to the little Italian girl. An adorable collection of the stories of WW2 couples: how they met, what being married during the war was like, and how they stayed together. I loved the photographs, and the stories were interesting, but most couples wanted to focus on when they met and married and only provided basic details about the toll separation had on them, how difficult rationing was and raising children. The desire to not dwell on the war is understandable, but I was hoping for more details and more depth. pg.203 The weight of the explosives made an already tricky landing more difficult, and as they made their approach, Robbie knew they were in trouble. "Without warning th Each chapter of this book is based on a couple; how they met, how they became engaged, married, experience in WWII, and how they've made their marriages last 60-70 years. "If you marry, you marry for life...Divorce is not an option." It was amazing to read about these couples working through difficult situations to make their marriage possible. Some even came from different political or religious beliefs and still continued to spend seven decades together. The reoccurring theme I saw in the love lessons was listening to, loving, and excepting your spouse for who they are. Some other cute ones were to have a good attitude and laugh a lot! Wartime brings out some of our strongest emotions, but arguably one of the most powerful is love. With the very real possibility of death hovering over them, men and women of the 1940s often rushed to get married before the soldier shipped off to war, or made a commitment to marry once the war was over. They often wrote ardent letters to each other full of dreams of the future. Those letters became the glue that kept them together when the fighting, the waiting, and the separation became too muc Wartime brings out some of our strongest emotions, but arguably one of the most powerful is love. With the very real possibility of death hovering over them, men and women of the 1940s often rushed to get married before the soldier shipped off to war, or made a commitment to marry once the war was over. They often wrote ardent letters to each other full of dreams of the future. Those letters became the glue that kept them together when the fighting, the waiting, and the separation became too much. 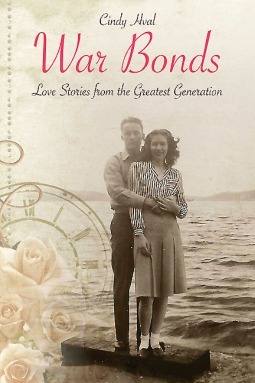 War Bonds: Love Stories from the Greatest Generation by Cindy Hval brings many of those stories to life. A journalist, Hval gathered 36 stories from men and women across America and compiled them into this wonderful volume. Each story features wartime photos of the couples, as well as photos of their lives together 70 years later. This is perhaps the most poignant feature of the book, to see how their marriages have lasted for more than half a century. They will be the first to admit that it certainly hasn't been a bed of roses, but has taken commitment, strength, courage, and devotion to stay together through thick and thin. There's Jerry and Nancy Gleesing who married and were expecting their first child before he was sent overseas, shot down over Hungary, and taken prisoner by the Germans; Gene and Evie Fields who waited to marry until Gene came home, carrying a Purple Heart he earned from wounds received in Italy; and Dean and Betty Ratzman who met as college students on a blind date in 1943 and married in February of 1946. These are just a small sampling. Included with each story is a snippet of relationship advice from the couple, and it is here that you can catch a glimpse into the truth behind their marriage's longevity. War Bonds is not a five star book. It just isn't. I know that objectively. But I am throwing all the available stars at it anyway because it made me feel everything and think thoughts and ask questions and look for answers and cry happy tears. First, thank you to my sister, Ellen, for sending me the book. Second, this isn't a novel. It is a series of chapters, each just a few pages long. Each chapter covers a different WW2 couple. Simple as that. Who they were, how they met, when they got married War Bonds is not a five star book. It just isn't. I know that objectively. But I am throwing all the available stars at it anyway because it made me feel everything and think thoughts and ask questions and look for answers and cry happy tears. First, thank you to my sister, Ellen, for sending me the book. Second, this isn't a novel. It is a series of chapters, each just a few pages long. Each chapter covers a different WW2 couple. Simple as that. Who they were, how they met, when they got married, how they were impacted by the war, their life together after, and any advice they want to share on life and marriage. There isn't enough time in the few pages each couple gets to really get to know them, the reader does a lot of reading between the lines about triumphs and tragedies. Nevertheless my heart swelled and broke and was healed. The stories can start to run together easily - I only read 2 or 3 chapters at a time. That gave me time to savor each one and stretched out the experience for months. This is a great resource when you need inspiration. It isn't particularly well-written and the format is awkward and I cherished every moment reading it. I have a confession to make. I'm not a history buff. When browsing book covers (no, you can't judge a book by it's cover, but you can't deny that everyone does it anyway), I will avoid books with vintage photos and titles intimating the past. I had a feeling, though, that War Bonds would be different, due mostly because it is a book simply chock full of love stories. The love stories aren't your ordinary boy meets girl, boy loses girl, boy gets girl again Holly I have a confession to make. I'm not a history buff. When browsing book covers (no, you can't judge a book by it's cover, but you can't deny that everyone does it anyway), I will avoid books with vintage photos and titles intimating the past. I had a feeling, though, that War Bonds would be different, due mostly because it is a book simply chock full of love stories. The love stories aren't your ordinary boy meets girl, boy loses girl, boy gets girl again Hollywood popcorn stuffers either. No, they are the tales told by those who have lived through the worst, have managed to survive, together, through love's strongest test--the test of time. I wouldn't say these stories are recipes for success, but I would say that there are some extremely valuable lessons regardless. Most often the lesson of "how do you stay together despite everything" is simply that you do, that you are fond enough of each other that you just keep moving forward. I get that the simple lessons of folks who have been there are hard to take into our everyday struggles, but they are no less important to hear. I enjoyed reading Cindy Hval's War Bonds. The book is a collection of love stories. Each chapter features a new couple. Each chapter is short in length, but, not lacking in heart. What the chapters all have in common, of course, is that all the husbands fought in World War II. Another commonality is that all the marriages lasted. Each story is worth sharing; each voice deserves to be heard. I enjoyed meeting all the men and women in this book. I enjoyed their stories: stories about how they met, I enjoyed reading Cindy Hval's War Bonds. The book is a collection of love stories. Each chapter features a new couple. Each chapter is short in length, but, not lacking in heart. What the chapters all have in common, of course, is that all the husbands fought in World War II. Another commonality is that all the marriages lasted. Each story is worth sharing; each voice deserves to be heard. I enjoyed meeting all the men and women in this book. I enjoyed their stories: stories about how they met, when and where they met, how they fell in love, their courtships--in some cases years, in other cases mere weeks, their proposals, their weddings, their marriages. The book shares their challenges and struggles: before, during, and after the war. I really enjoyed the photographs as well! I would definitely recommend War Bonds. I love reading about World War II both fiction and nonfiction. I love reading love stories. This book was just right for me. War Bonds is a collection of short essays on the lives of World War II-generation couples who often turned courtships of three months or less into six decade marriages. Collected and told by a newspaper columnist, each section reads much as a surface human interest story complete with a love lessons advice from the couples and a representative war time song. The result does lack some depth, presenting a vivid but disappearing greatest generation much quieted by time and hindsight, but the very d War Bonds is a collection of short essays on the lives of World War II-generation couples who often turned courtships of three months or less into six decade marriages. Collected and told by a newspaper columnist, each section reads much as a surface human interest story complete with a love lessons advice from the couples and a representative war time song. The result does lack some depth, presenting a vivid but disappearing greatest generation much quieted by time and hindsight, but the very definition of heartwarming. And kudos to the author for a title in pun. Cindy Hval has a gift for telling a story and finding the nuggets that make each one come alive - as I read WAR BONDS, flashes of familiarity would wash over me - as if I just had the chance to really get to know the couple whose story I read. Put in the context of war, and that war, made history come to life - no longer history, but actual life. Love, love the love lessons - and the photos in between. I spent the majority of the time with tears in my eyes, imagining this or that. It takes a tru Cindy Hval has a gift for telling a story and finding the nuggets that make each one come alive - as I read WAR BONDS, flashes of familiarity would wash over me - as if I just had the chance to really get to know the couple whose story I read. Put in the context of war, and that war, made history come to life - no longer history, but actual life. This is an excellent collection of short, true wartime love stories that warm the heart while teaching about the extreme power of love along the way. The couples in these stories all met and married during WW2, and stayed married, "until death do us part". Marriage is never easy, but in many of these stories, couples endured under extreme duress. The author uses quotes from the biographies written to help us, (the readers), understand the secrets of their success. A wonderful read, 5 stars. What an uplifting book! Life for these young couples "in love" was not easy during the years surrounding World War II. Yet they stayed married and after decades of marriage, they still loved being together. The individual stories are well-written,interesting, and inspiring to those of us who have only been married a short 30+ years. I enjoyed reading the "Afterward", where the author discusses what she learned from interviewing these 50 couples who had been married over 60 years. Very interesting book about real romance, devoid of the drama and glamour one expects of fiction yet still heart warming and beautiful. I often enjoy reading fiction/nonfiction about the "Greatest Generation" because they were survivors and pioneers, they loved, they lost and they rose to the task during times of great tyranny. But this book had something more because each story was personal and these people felt very tangible to me. Made me relive story-telling from my Grandmother. A sweet book about WWII veterans and their spouses - looks similar to Larry Kings Love Stories of World War II. Each chapter is only 4-6 pages telling how each couple met and a bit about their lives. Absolutely inspirational. It could've been edited better, a few grammar and spelling mistakes, "road" instead of "rode" for instance. But completely willing to overlook that because of the content. Quite liked it! I knew one of the veterans who is in the book. I found a special reason for reading the book and learned more about his lovely wife Vi. This is a series of very short stories about a number of veterans and their spouses. The title is very intriguing to me and the concept of the book gave new meaning to my study of WWII. This is a really lovely book and I was delighted to be given an opportunity to read a review copy from the publishers. It details some of the stories of couples that met during World War II. The book is really touching in places and I feel genuinely privileged to have been able to review this. I highly recommend this. This delightful book would be a good wedding or anniversary present for young couples. Included in these stories of long term marriages are nuggets of wisdom about how to stay happy together. The top three: friendship, respect and commitment. I love this era. Their lives might have been hard without much money but the optimism this generation had served as a foundation for our future. No wonder they are called the greatest generation! Loved this book - very similar to the one with Larry King, but I loved this more because it was all couples who were married during WWII and were still married sharing their story - at the end of each section, the couple had a little "love lesson" - or small piece of advice. Great read! just as it promises, this book is a varied collection of love stories. it's both a sweet and interesting snapshot of another time. I loved War Bonds I've read it more than once. I recommend it as a great read. This was a good read on Veteran's Day. To read of love stories from WWII and how they lasted was inspiring. Cindy Hval is a columnist and correspondent for The Spokesman Review newspaper in Spokane, Washington. Her “Front Porch” column offers humorous, often poignant commentary about life, love and raising sons– not necessarily in that order. Her first book, "War Bonds: Love Stories From the Greatest Generation" was published by Casemate in 2015. She's currently working on her second book "Tiaras & Cindy Hval is a columnist and correspondent for The Spokesman Review newspaper in Spokane, Washington. Her “Front Porch” column offers humorous, often poignant commentary about life, love and raising sons– not necessarily in that order. Her first book, "War Bonds: Love Stories From the Greatest Generation" was published by Casemate in 2015. She's currently working on her second book "Tiaras & Testosterone: TNT." You can also read her work in numerous anthologies including 10 volumes of the Chicken Soup For the Soul series. Cindy is the mother of four sons ages 28 to 18 and is owned by two cats, also boys. She and her husband, Derek, recently celebrated their 32nd anniversary.